Was Arjun Rampal Sent Back From Kapil Sharma’s Show Without Shooting? Actor Reacts! Stand up comedian Kapil Sharma is known for his comedy talk show ‘The Kapil Sharma Show’. Comedian Kapil Sharma has cancelled several shoots or delayed them for his failing health in the past. The show is falling after Kapil Sharma had a fight mid-flight with co-star Sunil Grover. It caused a lot of controversies which led to the TRP’s of the show to drop even more after Sunil Grover quit. Recently the comedian was said to have cancelled the episode with yet another Bollywood actor Arjun Rampal. Other actors like Shah Rukh Khan and Arjun Kapoor who were coming to promote their respective movies had to face similar reasons. 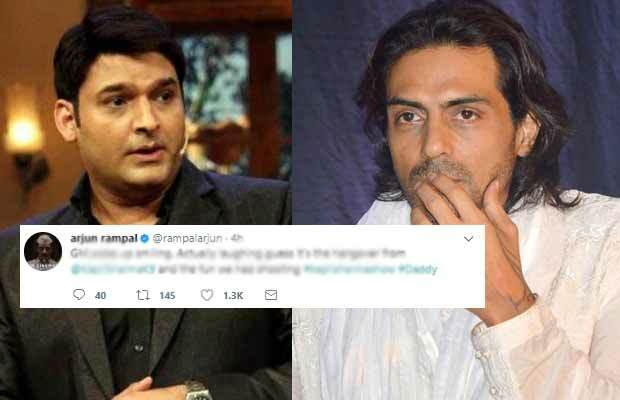 Reports suggested that Arjun Rampal and co-star Aishwarya Rajesh had to wait for hours for Kapil Sharma who never showed up owing to ill health. But the rumours were shut down by the actor himself who clarified via twitter that the shooting had taken place after all. Now Kapil Sharma joined the banter and thanked the team of Arjun Rampal’s upcoming movie ‘Daddy’. He also tagged the heroine of the movie actress Aishwarya Rajesh. The actress replied back with a tweet thanking Kapil Sharma for the wonderful evening and for making them all laugh so much. Kapil Sharma has been in the news lately for the dropping TRP’s of his show ‘The Kapil Sharma Show’. It was rumoured to be going off air but was renewed for another season at the last minute by the channel. Arjun Rampal’s movie ‘Daddy’ will be releasing on September 8th. It is a political crime thriller about the underworld life of Mumbai and is produced by Arjun Rampal. Watch Video :Krushna Abhishek REACTS At Competing With The Kapil Sharma Show! Previous articleBharti Singh’s New Show Comedy Dangal HIT Or FLOP? Twitter Reacts! Next articlePhotos: Kareena Kapoor Khan’s Son Taimur Off To Nani House!